The beautiful San Francisco area, and particularly the scenic North Bay, is a very popular place for tourists and travelers to visit so it is no wonder that this area has received more than its fair share of bus accidents. Because of the large number of passengers on board, and the enormous size and weight of bus vehicles, they tend to cause extremely serious injury. A careless bus driver can easily cause an accident with either an improper turn, a lane change without a signal or a number of other careless omissions. Buses pose a serious risk not only to passengers, pedestrians, and other motor vehicles on the road but they can cause a great deal of property damage in urban settings. Whether you are an injured passenger, driver, pedestrian or bystander, the experienced and skilled personal injury attorneys from the Law Offices of Michael A. Fiumara have achieved great results in representing injured bus accident victims to ensure that their full and fair compensation for all damages gets promptly paid covering medical expenses, rehabilitation, pain and suffering, and present and future lost wages. Oftentimes a bus driver’s mistake, bad driving and/or omission by not following the true letter of the CA Vehicle Code can lead to a catastrophic accident that not only injures the passengers on the bus, but bus drivers can also be responsible for causing car accidents, motorcycle accidents, and truck accidents in the path of their destruction. No two bus accidents are the same, but there can be one or multiple causes for a bus accident. The highly skilled and experienced personal injury attorneys employed by the Law Offices of Michael A. Fiumara are ready to demand justice from the civil legal system against any and all negligent parties, government agencies, regulatory agencies, and insurance carriers that may have had a part in the bus accident. To ensure that your life is fully restored and that your health is rehabilitated to where it was prior to the accident, we do everything in our power to represent your interest in dealing with insurance carriers or any of the negligent parties. For those clients without adequate medical coverage or for those who lack medical coverage even after implementation of the Obamacare Act, we often arrange for the injured party to receive superior medical care financed by a lien arranged by our office. Therefore, regardless of the cost or extent of the treatment that you receive, you will receive compassionate and competent medical care to ensure your full recovery. The law firm employs a contingent fee arrangement so that the injured party does not have to pay any money out of pocket for the medical services during treatment and while the law suit is open. The law firm is not paid unless a settlement or a verdict is rendered in our client’s favor. The driver who has ingested drugs and/or alcohol. The distracted or careless driver whose bad driving habits contributed to the accident. The bad or careless driving habits of the other vehicle driver which is another contributing factor. The failure of the driver to yield “right-of-way” to a pedestrian victim or another obstacle that may be in the roadway. The driver hit a barrier or ignored obvious traffic signals. There are many more common acts of negligence which we carefully examine to establish fault or liability. Numerous severe injuries can result from any bus accident, and victims often suffer life lasting injuries such as brain, spinal cord injuries, major sprains, fractures, lacerations, amputations, internal and soft tissue injuries including to major organs, and concussions. 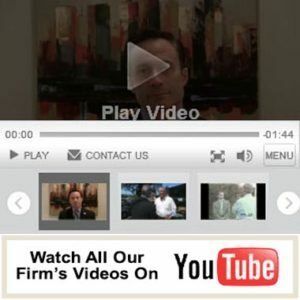 The attorneys at the Law Offices of Michael A. Fiumara take your injuries extremely seriously and will pursue your right to compensation for pain and suffering as well as for medical expenses so that all responsible parties are held responsible for lost wages from work attributed to the bus accident. To ensure that your recovery and rehabilitation is handled expeditiously, all of the negotiations with insurance carriers and negligent parties are handled professionally by our bus accident attorneys. Our attorneys can decipher complicated, confusing and tricky insurance policies to ensure every possible dollar of compensation that is due and owing. Many times our clients have sustained major concussions and other brain injury, sprained muscles and torn ligaments, spinal cord injuries resulting in paraplegia/quadriplegia, internal bleeding, coma/ventilation, and damaged internal organs that have far reaching effects years later in our client’s lives. That is why it is imperative that we represent our clients in an ethical yet aggressive manner. Our goals are the same as yours and it motivates our attorneys to get the most favorable compensation that you deserve. Our lawyers are always available for travel to your home, rehabilitation or medical facility to answer any and all of your questions regarding your case 24/7. We know that this is on your mind constantly because of the seriousness of the injuries and the complexities of personal injury cases. This allows our clients a comfort level so that they are more comfortable during this difficult time and can focus on a full and speedy recovery. If you have been injured in a bus accident whether you were riding on the bus or were in another vehicle or a pedestrian, a Santa Rosa bus accident lawyer from the Offices of Michael A. Fiumara can provide you with the advanced and skilled representation you will need to get full compensation for your present and future injuries. Bringing a claim arising from a bus accident can be extremely complicated and confusing by conflicting issues involving governmental immunity, determination of fault or liability, fraud, and insurance adjustors who try to use every word you retorted against you and out of context, so it is imperative that you have an attorney who you know will professionally handle these issues for you during this difficult time. We turn over every stone to advocate for you and to help improve your chances that your settlement will be a full and fair compensation package. Therefore, we look at many bus accidents as being the fault of not only the inexperienced driver but also the improper training and supervision of drivers and have also found that product liability may also play a role in causing bus accidents. A manufacturing defect or a brake part recall or any other cheap or defective bus component part could have played a role in causing the accident that injured you. Unfortunately, intoxication and drug use can also be at the core cause of a bus accident. An experienced and skilled team of attorneys such as those at the Law Offices of Michael A. Fiumara will investigate your specific accident determining the true causes and the true parties at fault and proceed aggressively against all parties to achieve full compensation for you. Please call our office at (707) 571-8600 in our centrally located Santa Rosa office in Sonoma County or call our office in San Rafael in Marin County at (415) 492-4507 to schedule a free and confidential case evaluation today.